A few weeks ago I received my favourite pasalubong from my siblings through a relative who went on a vacation in the Philippines. Then I also received some books that include my favourite personal finance book: Financial Planning for the Fast Changing World by Christopher G. Cervantes. I recommend this book to newbie investor and anyone who wants to learn more about financial literacy. You can follow along and find out if this something you also want to pursue in the future. Ask a trusted person to get the checklist and form for you. They can mail it overseas or do the pwede padala tradition similar to what my siblings did. 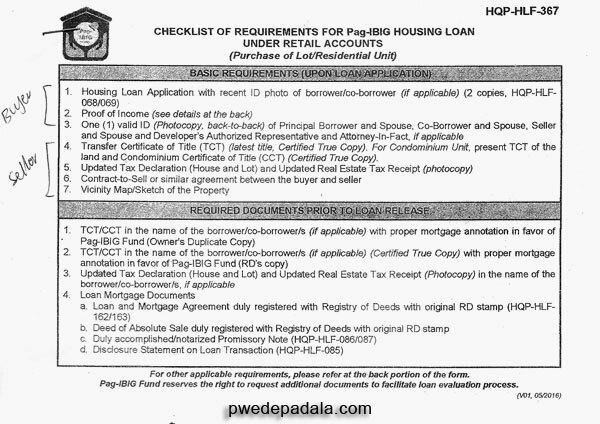 You can refer to the front screenshot of the Checklist of Requirements since it was noted by the Pag-IBIG staff whether a document is either required for a buyer or seller. Next, I’ll give you a peek of the checklist of requirements for OFW. I summarized the list of Pag-IBIG housing loan requirements for OFW and marked the documents (CHECKED) that I already have. I ONLY included the requirements that are applicable for me as an OFW. You can refer to the Checklist of Requirements for the complete list for self- and locally employed members. After the checklist let’s move on to the application form. Writing my personal information on the Housing Loan Application form is straightforward but I have to clarify some information to the Pag-IBIG Facebook Page. The property that you are going to purchase will be your collateral in availing our housing loan as you will submit the certified true copy of the title together with the other needed requirements. You may visit this link for more information on our housing loan program. See, I told you they are not only fast but smart too. Kudos! I have three credit cards in good standing. One of the cards has a high credit limit though I’m not sure if it can positively affect the housing loan application. Maybe I should ask. For the character references, I chose my relatives in Canada and in the Philippines. I might as well add a friend in the list for variation. If you have question in filling up the housing loan application form, let me know in the comment and we’ll figure out how to accomplish the form. In the Certification section of the Housing Loan Application form, the following fees are specified. Years ago my only concerned is to buy when the hoodie I kept checking online goes on sale for at least half its original price. And now this housing loan. So much for variety in to-do list and adulting. I’ll update this blog post with any progress I make in completing the Pag-IBIG Housing Loan requirements for OFW. You can follow my journey of buying the dream house; I’ll write the lessons, tips, and struggles (not a lot I hope). Are you also planning to apply for a housing loan of buy a house? Share your journey in the comment. NEXT: Is FarmOn a Virtual Farming Investment Opportunity for You? Hello, thanks for sharing your info, currently I’m looking forward na ma apply sa of Pag-IBIG fund ang house na kinuha ko sa pinas. Good luck Anne. Are you working abroad and will have a representative to do all the processing in the Philippines? Is there mandatory down payment required and if yes how much? You can use the Housing Loan Affordability Calculator to find out the estimate of equity (the amount you have to pay) because Pag-IBIG cannot loan the whole value of the house being sold. Even then, Pag-IBIG will conduct an appraisal to determine the value of the house. To make it simple, expect to pay 20% of the market value of the property. Hi, thank you for sharing your ideas on how to process Pag-ibig loan for ofw. I am a bit concerned with the ITR. I am a Dubai based ofw and fortunately we are tax free here. I had an ITR in my previous company in the Philippines but I doubt if its valid. Should an ITR necessary? But do you get any report about your income every year from the government? It would be best to contact Pag-IBIG on Facebook to get a faster response. They might also ask you to submit a payslip. Or if you have a co-borrower, she/he can submit the ITR. Best of luck. Keep us updated.